From time to time I publish revisions and corrections to my books on Amazon. At times, I even publish completely new editions, of a book. Usually I make the updates available for free where someone has purchased an earlier edition. In this brief article I want to share the process for accessing an update to a Kindle book. I’ve broken this down into a series of steps below. If this fails for you, be sure to read the additional information at the end of the article. Go to the Amazon site and log-in before following the instructions below. Place your mouse over the “Your Account” menu drop-down. This is on the top right hand side of the screen where it says "Your Account". You can see an example in the screenshot below. 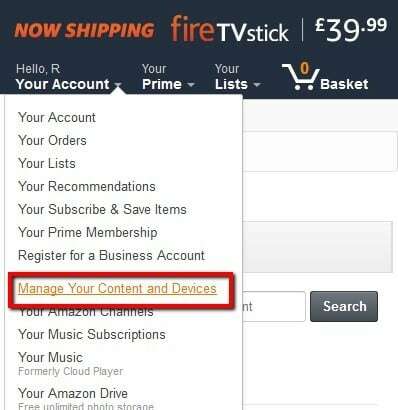 Select the “Manage Your Content and Devices” option from the drop-down list. You will then see a page displaying all the Kindle books in your personal library. This list defaults to the order you purchased the books, but you can change this. There's also a helpful search box top right which can save you scrolling through lots of books. In the list, locate the book you want to update. You should see a button to the right side of any book which has an update available, as shown below. Button indicator when updates are available for a Kindle book. 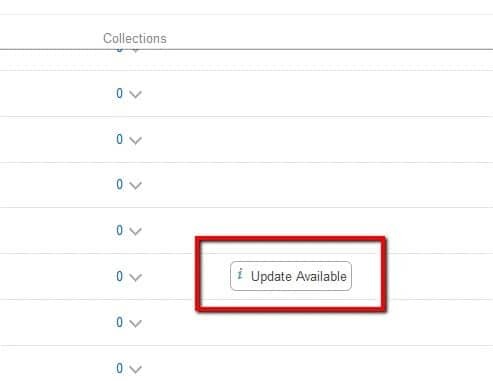 Click the button to display the update dialog as shown below. 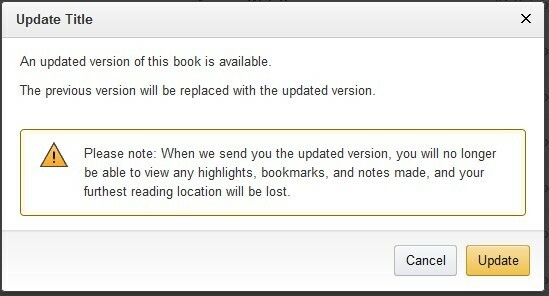 Dialog asking you to confirm you want to take the updated version of the Kindle book. When you click the Update button the new version of your book is sent to your Kindle or Kindle Reader software. Recently Amazon Kindle support advised me that they don't always show the "Update Available" button. A key factor in determining this appears to be the level of change in the book. If the new version of a book has a lot of changes over the previous version, they might hide the "Update" button. This is to minimise the risk of someone losing any notes they may have saved to a book. In these instances, Amazon advised you should contact their help desk and ask them to make the latest version of the book available. They will then release that version to you for download. It doesn’t work. I updated my manuscript and when the updates wouldn’t show for me I wrote to Amazon for help. They told me to download my book from the manage your content page, then upload it to my kindle via usb. I did that, nothing changed. I don’t know what to do now. Amazon assured me the updates were there, but I think it’s stupid that if you (the author even!) already purchased the original book you can’t see a freaking update! I have no idea, other then Amazon’s word that it worked. I had planned to make this a series, but now I am at a loss as to whether I should continue or not. Really wish Amazon would fix this! Hi Beth, unfortunately, I have no control over books sold through Amazon although I am surprised you’re having such an issue. Their support is normally very good. I have to agree with you though that receiving updates can be a problem and I wish it was better. It is worth checking in my Lenscraft shop if the books you want are sold there. I now publish all books there as well as on Amazon, Google Play, Apple and Barnes & Nobel. When I publish an update to an existing book on Lenscraft, all customers who purchased from Lenscraft are notified of free updates to download. your revised version of Nik SilverFX Pro is not shown with an update button on my kindle books in the Amazon UK website. I can’t seem to find the right question to get help from Amazon. Can you send me a link or offer some guidance please? Now you can select “Digital Serives” from the categories. Select “My Kindle Books” from the dropdown. Select “Purchased Content Didn’t Download” from the second dropdown. Scroll down to the bottom of the page and select the contact method. Don’t worry that this option isn’t your exact problem, just explain the position. Amazon help has always been very good when I have contacted them. If you go to your Books on Kindle there should be a link to view either “Downloaded” or “All”. To view the all you need a WiFi connection. The book should be listed there and can then be downloaded. Still no update appearing as of today. I have just sent out a mailing to advise. Amazon will only release the book to individuals who request it directly. This is to protect peoples notes and highlighting in the old version. But there is a second alternative mentioned in the email. If you log in to your lenscraft account, you will be able to download a Free PDF version of the book from my Lenscraft Store (https://lenscraft.co.uk/lenscraft-store/). This is time limited until the end of July so please ensure you download your copy. I hope this helps everyone and I’m sorry for all the difficulty experienced. Hi Joe, Please accept my apologies. I have reported this to Amazon so hopefully it will be resolved shortly. Hi Robin. I think I’ve followed instructions but no success. Hi Heln, Please accept my apologies. A lot of people are experiencing problems. I have reported this to Amazon so hopefully it will be resolved shortly. I followed the instructions above, but there is no update showing for your Viveza book. Could it be Amazon has not uploaded it yet? Please accept my apologies. Some people appear to have the update but the majority are experiencing problems. I have reported this to Amazon so hopefully it will be resolved shortly.